Whether you voted for Donald Trump or not, he’s now the president of all… blah blah you know the rest. The day after the inauguration, millions of women and a peppering of men took to the streets in a global display for women’s rights and presidential discontent. 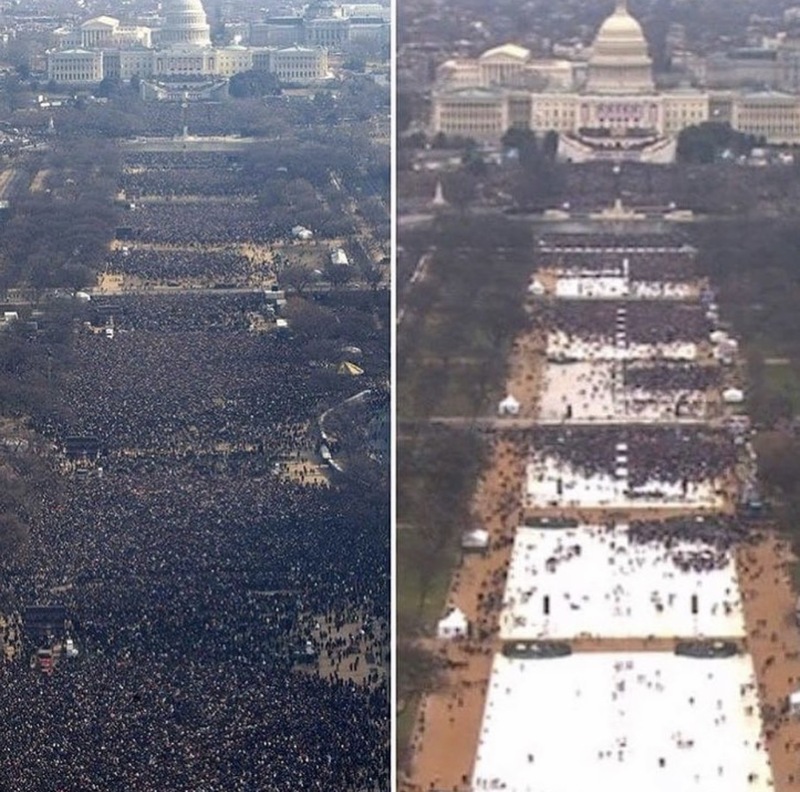 The very same day, Donald Trump made a widely criticized, self aggrandizing freestyle speech straight off the dome on hallowed grounds at CIA headquarters, disputing photographic evidence of the inaugural crowd size. That alone was all the news that’s fit to print… until Press Secretary Sean Spicer, in his maiden voyage, took the lectern in the White House press briefing room. Flanked by monitors displaying photos of Trumps inauguration viewed from the Capitol building, Spicer came in hot and forcefully accused the media of “false reporting” in an effort to “lessen the enthusiasm for the inauguration” by using photos that were “intentionally framed in a way to minimize the enormous support that had gathered” (for the historically least popular incoming president). He didn’t stop there. 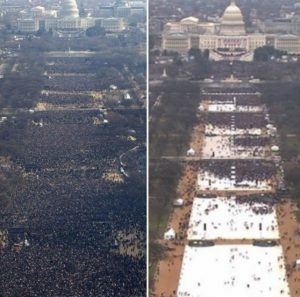 Armed with untrue statistics, Spicer declared, “This was the largest audience to ever witness an inauguration, period, both in person and around the globe.” Spicer then marched out of the room and didn’t take any questions. OK… well let’s fact check that statement. All you need to do is look at a photograph. By using my eyes, I can see that Trump’s inauguration attendance was sparse compared to presidents’ past. Saying the word “period” after a sentence, doesn’t qualify the statement as factual. The media quickly struck back with puzzled pundits questioning the motive of Trump sending Spicer out to the press in such a bizarre childlike manner. Political junkies like myself were anxiously awaiting the administration’s narrative come Sunday morning as they made the rounds on the network TV circuit. The pushback was stunning. Like an abusive partner that doesn’t get her way and wields too much power in an unhealthy relationship, Conway subtly threatened the press – maybe we should just break up then. This marks the beginning of the end of the fourth estate’s role in the Trump administration. Conway alarmingly added, “Don’t be so overly dramatic about it, Chuck. You’re saying it’s a falsehood… Sean Spicer gave alternative facts to that.” Alternative facts, as Chuck Todd pointed out, are falsehoods. There are no such things as alternative facts. Shortly after the interview, Merriam Webster tweeted the definition of the word fact as “a piece of information presented as having objective reality,” adding, “in contemporary use, fact is generally understood to refer to something with actual existence.” You know we’re in trouble when the dictionary has to take to Twitter. It’s clear that Trump and his strategists are preparing the country for a departure from factual reporting which leads to the absence of accountability. The fact that they sent Spicer out to argue something that is so easily disproved, means they are laying the groundwork for a public soaked in disinformation. People will be forced to choose between their instinctual idea of truth or believing what the administration tells them. The more you muddy the water, the less you see through it all. The Great Soviet Encyclopedia in 1952 defined disinformation as “the dissemination of false information with the intention to deceive public opinion.” The Russians have used it effectively since the 1920’s to subdue their own people and disrupt the consciousness of others. It is hard to draw conclusions, never mind solve problems, when people are working with different sets of “facts.” This tactic results in a counterproductive discourse that bears no traction in either direction, while the powers that be are able to manipulate the reality in whichever way they please. This is what happens when you allow “alternative facts.” We’d be blind not to acknowledge the similarities of Kremlin tradecraft and the current administration’s path toward social confusion. It was easy to feel a difference on the first day of Trump’s presidency. Presidential he was not. He was still talking about the election, himself, how many Time magazine covers he’s been on, and how he’s “like a smart person.” He immediately tried to deny the gloomy feel of his rained-on speech, the small turnout and overall ominous vibe of the day he took the oath. It felt different. His first order of business with the media was to scold them for reporting the truth, and then threaten to break up with them if they didn’t fall in line.